The lawyers across Kerala abstained from today’s court proceedings in a show of solidarity to Thiruvananthapuram Bar Association, in wake of alleged attacks against lawyers. Decision to abstain was taken unanimously taken in an Extra Ordinary General body meeting convened yesterday at 5 pm in Association hall. 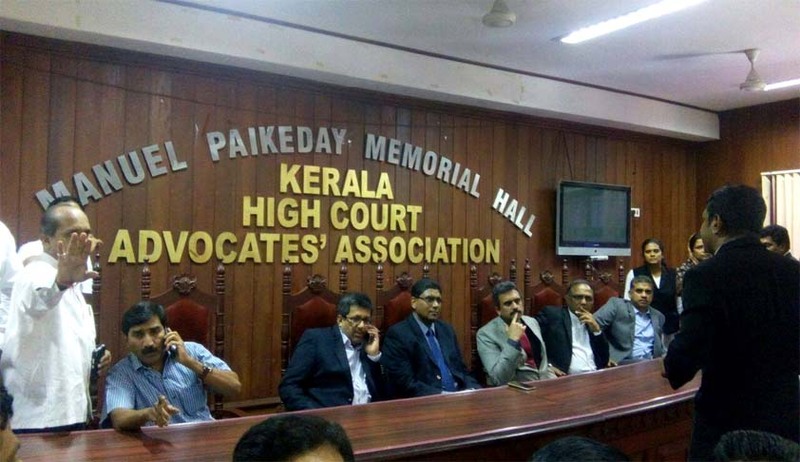 Today in the morning session, Justices Jayasankar Nambiar, P B Suresh Kumar, Mohammed Mustaque, Anil K Narendran, S P Chali, Raja Vijayaraghavan, came down to the Association hall and had a meeting with Lawyers. The members of the Bar presented the facts leading to protests before the Judges. They reportedly expressed their solidarity with association. During this time news got flashed in media that Chief Justice of India has directed to open the Media room which was closed by Registry. But later the Association informed that they have spoken to Justice Kurian Joseph and confirmed that no such direction has been issued from the Supreme Court. Read about recent happening in Kerala High Court here. Read the Column by Advocate Hariraj M.R titled “Why I abstain from Court?